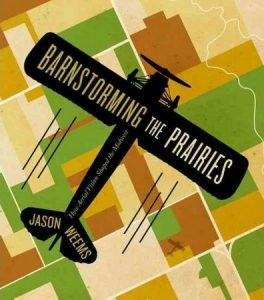 As a resident of eastern Iowa, the heart of “Grant Wood country,” Jason Weems’s new book Barnstorming the Prairies: How Aerial Vision Shaped the Midwest was personally resonant. Weems situates his analysis of aerial vision and its impact on the American visual experience of modernity in the Midwest because of the regional importance of aerial photography to agricultural practices. Weems considers how midwestern artists, such as Grant Wood and Frank Lloyd Wright, were impacted by the agrarian landscape and employed aerial vision in their work. In the introduction, “Aeriality and Midwesternness,” Weems outlines two clear goals; the first is to analyze the relationship between “vertical views and the realization of grand schemes of rational planning and control,” and the second is to show the ways in which different midwesterners have subjective experiences with and different sentiments about the landscape. He focuses on the 1920s and 1930s, because of the flux in the regional identity. During that time, modern technology in agriculture, transportation, and communication transformed the region from a landscape made up of individual farmers into one increasingly consolidated for large-scale agricultural production and distribution under federal oversight. Weems studies regional identity through “the processes of aerial seeing, picturing, and thinking,” or what he terms “aeriality.” (xi) As he explains, aerial images both “served as tools for the institution of broad systems of authority [the federal government], and . . . enable(d) and even naturalize(d) rural modernization. Yet by crystallizing abstract schemes into tangible images, aerial vision also granted midwesterners the power to . . . take ownership of modernization and adapt it to their own traditions and practices [Wood, Wright, and others].” (xii) A guiding principle of this identity lay in the Jeffersonian ideal of prosperity through the acquisition and cultivation of farmland by independent farmers, ingrained in the region since the 1785 Land Ordinance that created the grid-like landscape into townships and ranges.1 The adoption of aerial vision constructed new conceptions of the landscape and changed the relationship individuals had with it; therefore, the social order and local and national culture also changed, forcing inhabitants to rethink their regional identity in relation to this modernizing vision. Chapter one, “Pioneering Visions: The Midwestern Grid, the Atlas, and an Aerial Imagination,” addresses nineteenth-century uses of aerial vision. The author argues that the Midwest has always been represented by, and understood from, elevated viewpoints. The primary sources discussed in this chapter are broadscale and land ownership maps, bird’s-eye views, and illustrated atlases. Weems argues that in the era of westward expansion, the need to understand the landscape comprehensively—to create “viewing positions” through which cartographers, surveyors, and settlers oriented themselves—was necessary to both transform the landscape into farmland and engage in nation building. (8) The Jeffersonian ideal of a nation of independent landowners drove westward expansion, while the Cartesian grid overlaid the landscape and divided it by abstract and visual means, prepackaging it for easy sale. The grid also “inculcate[d] a broadly homogenous citizenry” in the process. (17) Although Weems does not cite architectural historian Dell Upton’s 2008 book Another City: Urban Life and Urban Spaces in the New American Republic in the bibliography, the assessment Weems makes is similar to that of Upton. The urban grid was a visible manifestation, Upton argues, of order and rationality, qualities that in the early-nineteenth century, represented a civilized society.2 Similarly, the rural grid can be understood as generative, a means by which to create civilization. The grid worked to classify the midwestern landscape and break it down into consumable parts. In addition, higher vantage points worked in conjunction with the grid to render a visually intelligible landscape, one that is able to be civilized. In discussing aeriality in the mid-nineteenth century, Weems focuses on bird’s-eye views, which represented the landscape and the grid while also idealizing the community. These views acted as aspirational representations of what these communities wanted to be, and less as documentation. As largely white communities settled the Midwest, Weems shifts his analysis to illustrated historical atlases, which became prominent in the late -nineteenth century. He interprets them from a user-based perspective, because these atlases contained maps, textual descriptions, and statistics, as well as portraits. The multimedia nature of the atlas allowed it to function in different ways for different audiences, which included settled community members, landowners, whose images and names appeared in the atlas, and potential buyers. This contradiction is revealed in Weems’s sharp analysis of the article “The Iowa Farm: A Corn and Hog Business Run by Machinery,” published in LIFE magazine in 1937. Not only does the article describe a family farm as a business, but the aerial photographs accompanying the text represent the landscape as an abstract and geometric network, that “weaken[s] the nostalgic mythologies of the small farm and Jeffersonian landownership.” (118) While the images depict the Jeffersonian grid as an abstracted, all-encompassing vision, they reverse the Jeffersonian ideal by presenting new agricultural trends as administered by the federal government and not the individual farmer. The structure of the article supports this reading through both the page layout and framing of photographs, and depicts the midwestern landscape as a modern one that preserves regional identity through government-sponsored change. In chapter three, “Adaptive Aeriality: Grant Wood, the Regional Landscape, and Modernity,” Weems employs significant formal analysis, which is a welcome change that helps the narrative pace. Weems argues that Wood used verticality, an overlooked aspect of his work, to reconcile both traditional regional culture and myths of pioneerism and individualism with twentieth-century modernization. These vertical views separate the past and present in order to critique twentieth-century technology and “ambitions,” and simultaneously represent the past and present together in order to reveal what a romantic and modern view of the region might be. Wood’s biography—born and raised on an Iowa farm; a childhood move to urban Cedar Rapids; art study in Chicago and Minneapolis; and multiple trips abroad—shaped his ability to represent the landscape in nostalgic, romantic ways, while also harnessing the potential of aerial perspectives. Wood adapted the bird’s eye view as a means of showing the topographical landscape and the life that occurred there. Weems claims that aerial vision allowed Wood to combine these elements and serve as “a metaphor for midwesternness.” (159) His work envisioned the conflicting psychology of the region, and as the 1930s progressed, the use of verticality in his work became sharper and more dangerous, reflecting the artist’s ambivalence about modernization, the top-down power of the New Deal programs, and the rumors that increasingly circulated about his alleged, though unconfirmed, homosexuality. Chapter four, “Jeffersonian Urbanism: Frank Lloyd Wright, Aerial Pattern, and Broadacre City,” centers on the 1935 model by Wright of Broadacre City, a plan that attempted to eliminate urban problems, such as overcrowding and the prioritization of industry over humanity, that he had critiqued in his 1932 publication, The Disappearing City. In the text, Wright called for urban spaces that would emphasize horizontality and rectilinearity, instead of verticality, restrictive city boundaries, and poorly planned areas without utilities or infrastructure. In this case, aerial vision was an “instrument for critique” for Wright, as “aerial perspectives offered the architect a means for reconnecting to the horizontality that he saw as essential for understanding the landscape as a natural form and shaping it to the needs of modern human experience.” (186, 214, 216) Wright based Broadacre City on the Jeffersonian ideals of agrarianism and individualism, and directly connected American culture to spatial form. Wright associated spatial verticality with government centralization, which he believed was antidemocratic. Wright therefore believed that people must live in horizontally oriented communities in order to preserve American democracy. This is shown in the one-acre, single-family home that he centrally placed in his Broadacre City design. In discussing Wright’s belief in the benefits of agrarian space for individuals, Weems also examines the rise of regional planning in the 1920s and the desire of planners and critics, such as Lewis Mumford, to incorporate urbanism and industrialism into the surrounding region and use already-existing infrastructure. This discussion helps to distinguish Wright from his contemporaries. In spite of Weems’s analysis of Wright’s Greenbelt Towns, which were ultimately supported by the federal government through the New Deal Resettlement Administration, he fails to fully articulate the differences between Broadacre City and traditional urban planning and suburban design. This would have emphasized the ways in which Wright’s designs were highly idiosyncratic and ultimately untenable. In the conclusion, “Over the Rainbow,” Weems attempts to show the continuation of aerial vision after the interwar period. However, the chapter tries to do too much and does nothing particularly well. It opens with an analysis of the 1939 film The Wizard of Oz, which Weems notes is a foil to Depression-era Kansas. Dorothy’s aerial view, seen while she travels to Oz, gives the young girl a new perspective that allows her to imagine the midwestern landscape differently. While Oz is a bucolic, agrarian place, where technology is not used for farming, its fields look as though they are contoured following federal recommendations. This dissonance between the bucolic environment of Oz and the technologically sophisticated, government-managed landscape of the Midwest is compelling, yet Weems does not fully explore it. Instead, he compares Oz to a 1944 International Harvester advertisement, which feels like an abrupt transition away from the film. This comparison allows Weems to summarize that by the end of the interwar period, the future of farming—done with industrial machinery, agricultural science, and government oversight—was normalized and represented, by looking backward, the fruits of labor dressed in the guise of a traditional farm setting. This was the contradictory nature of interwar aerial vision, where “Midwesterners looking at high-altitude photographs of their farmsteads saw the prospect of a new and integrated agricultural system. They also recovered in them elements of a yeoman ideology: not as simple nostalgia but, instead, as constitutive parts of a meaningful future.” (256) Weems contrasts this agrarian nostalgia with a discussion of aerial images of suburban Levittown, Pennsylvania, in order to show how Jeffersonian idealism was transformed after World War II into a suburban future. In suburbia, the streets similarly curve like contoured crops, and spatial order and social homogenization are legible in the landscape. Weems concludes with a consideration of contemporary aerial photography and Geographical Information Systems (GIS) technology, both of which provide greater information and more abstracted views. While Weems’s conclusion lacked cohesion, addressing as it did Oz, postwar suburbanization, and technological advances in aerial technology, overall I appreciated the variety of topics upon which the book touched. Weems analyzed photographs, reconsidered their use in magazines and published sources, introduced Regionalist painting, architectural models, and film, and read from a variety of disciplines, including American art history, visual culture, architectural history, and urban planning history. The book provides a model for analyzing aeriality across various media and in multiple guises, making it a comprehensive read that would prove useful in various courses, from art history to architectural and urban history. Barnstorming the Prairies also provided me with new fodder, as I look out the airplane window when leaving or arriving at Eastern Iowa Airport. About the Author(s): Andrea M. Truitt, PhD, is an independent scholar.